A project that began in a leadership class ended up being embraced by the whole community. 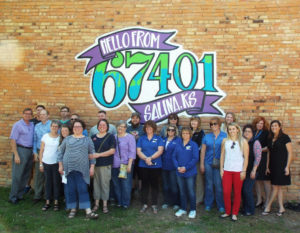 With the help of a grant from the Hansen Foundation, a colorful mural was designed and painted as a unique way to combine tourism and community pride with technology. The purpose of the mural is to get people to take photos with the mural and share them with friends online, thus creating knowledge of the community as a destination and exciting place to visit. It is somewhat of an incognito “billboard” for the city, while still providing beautification of an otherwise unused space through art. It appears to be working. The mural is showing up on Instagram and Facebook. An online contest was held to select a hashtag for the project. Locals are beginning to use the mural and #6740wonderful hashtag as a community symbol. In addition to receiving kind comments from City staff, we have been approached to use the mural and hashtag as a wider community pride initiative where the image would be used to sell t-shirts, lapel pins, etc.